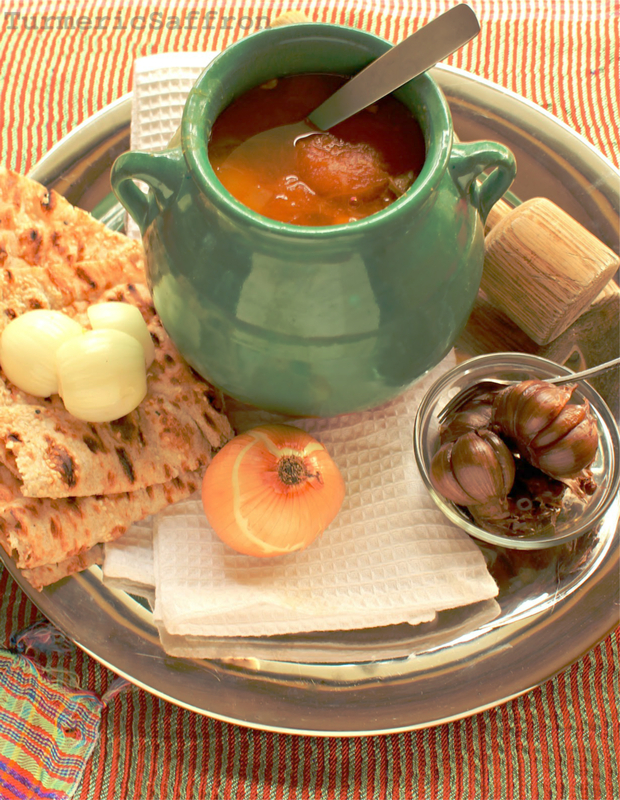 دیزی Dizi, a popular highlight of Persian cuisine, is traditionally cooked in a small stone crock pot or a metal cooking pot. The history of abgoosht goes back hundreds of years ago when it was only made with lamb and chickpeas. 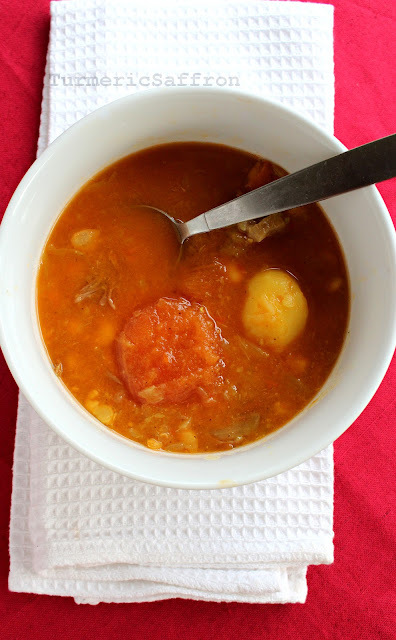 However, with the introduction of the new world foods into Iranian cookery and the addition of new ingredients such as potatoes and tomatoes, this modest meat and chickpea soup became a more substantial and tastier meal. Preparing food in a clay/stone cookware is one of the ancient methods of cooking where the clay pot is placed over an indirect heat or slow fire for several hours until all ingredients are fully cooked. 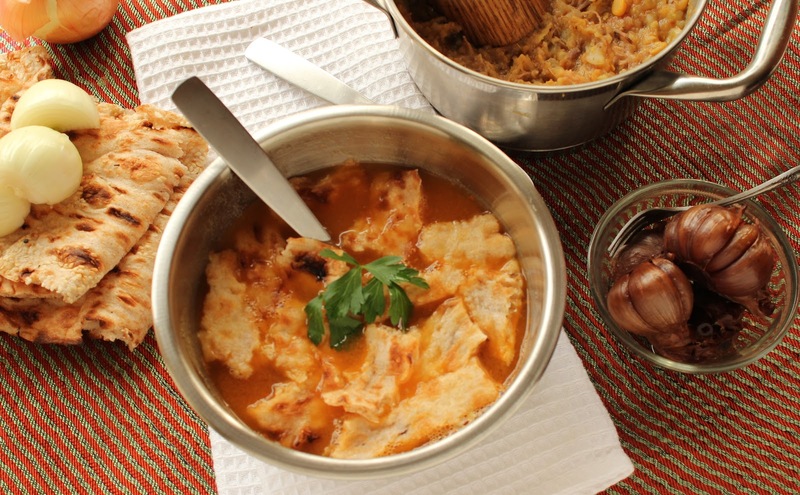 Dizi is one of the foods that's usually bought from a dizi specialty store due to its long cooking process and the need for a very hot stove. In today's modern kitchens, the clay pot is mostly used as a serving dish rather than cookware. 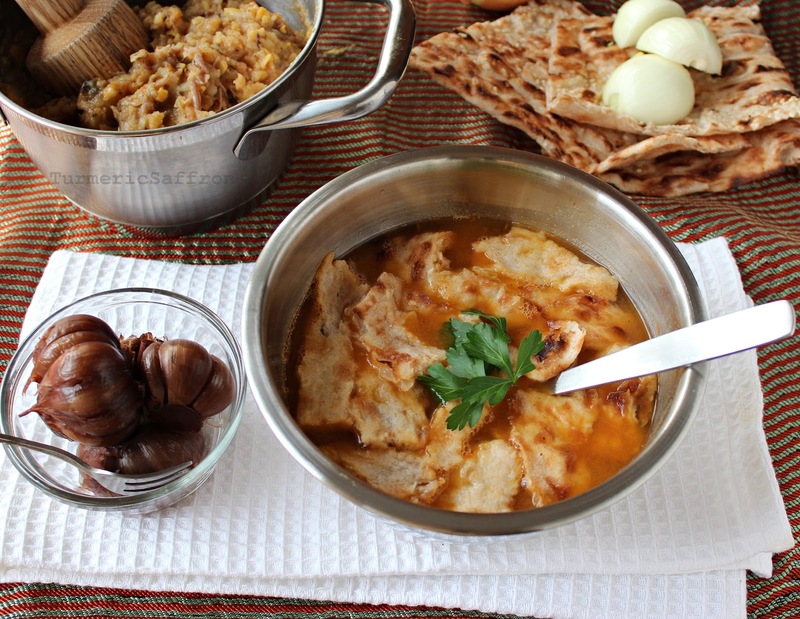 This slow-cooked, simple and down-to-earth meal, which is also known as abgousht/abgoosht, satisfies the hunger, nourishes the body and leaves one feeling gratified. Dizi is divided and served in two parts. The strained broth is placed in a large bowl or individual bowls and served. 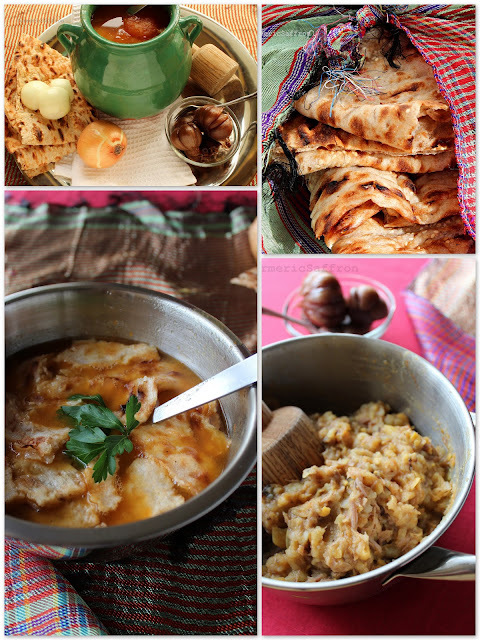 The remaining ingredients, lamb, potatoes, tomatoes, chickpeas and the beans are all mashed up together using a goosht-koob (meat masher) and served on the side with raw onions, torshi (pickles), sabzi khordan (fresh herbs) and plain yogurt. 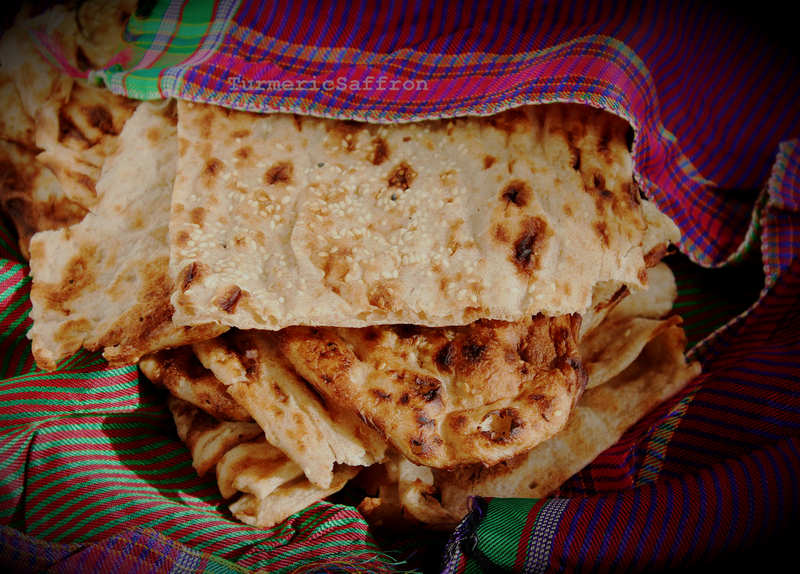 Noon sangak is an excellent choice of bread for this dish with its unique flavor and the unusual baking process of laying the prepared dough on the hot pebbles in the tanoor (tandoor) which I think makes it into the most interesting looking bread! Savoring dizi is a dining experience of togetherness, bonding and sharing. Whether you are sitting crossed-leg on the floor wearing your comfortable clothing around the sofreh (table cloth) or sitting at the dinner table wearing designer clothing you'll enjoy the tasty blend of flavors as well as the conversations and memories. Every time I make abgoosht I remember the scene form Ganj-e Gharoon, an old Iranian movie that's forever etched in my mind. It's the scene where Fardin and Zohouri are mashing the meat, tapping the marrow out of the bone, pounding the raw onion by hand and eating abgoosht all the while singing and teasing Arman! There are many different types of abgoushts. I have written a blog post about abgousht in the past and that's the recipe I cherish and use since it was my mother's recipe. This version is slightly different. In a large soup pot place the lamb shanks, add eight cups of water and bring to a boil on high heat. Skim the foam as they come to the surface in the beginning. Add the turmeric, cinnamon, limoo amani, onions, chickpeas, beans, salt and pepper. Cover and cook on medium heat for about an hour. Heat 2 tablespoons of oil in a small skillet and lightly saute the tomato paste to lose its raw taste. Add the sauteed tomato paste, tomatoes and the potatoes to the pot, cover and continue cooking for another hour. When all the ingredients are fully cooked, taste and adjust the seasoning. Remove the pot from the heat. Drain the soup through a sieve, remove the bones and mash the remaining ingredients using a masher. To serve, ladle the broth into a large serving bowl and spoon the meat and potato mixture onto a serving platter. Serve with warm bread, pickles, yogurt and fresh herbs.